The Thursday night game is Raiders-49ers, which, I’d rather die. But pregame, we get a sitdown interview with Jon Gruden (who you thought couldn’t nuke his roster any further after the trade deadline passed, but that didn’t take into account his chasing players into retirement), conducted by his “good friend” Howie Long. 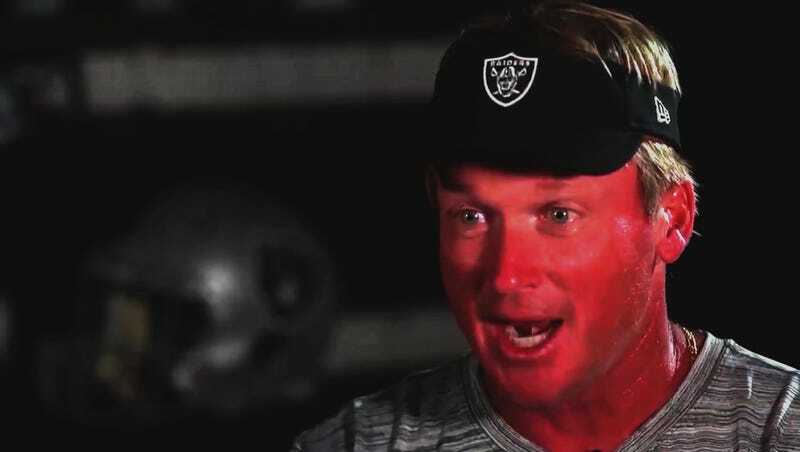 A true Gruden Grinder loves tampering! Regardless of all these definitely very real NFL players falling over themselves to sign with Oakland at a discount, it might be a while before the Raiders are good again. They’ve undeniably collected a haul of draft picks, but those picks are only as good as the people picking (and it would be a better-case scenario where those picks turn into players as good as the ones the Raiders gave away to get them). All of this is to say nothing of the difficulty of finding a franchise quarterback, or, uh, resurrecting the one you crushed into a teary paste. It’s an impressive piece of work to go from 12-4 to 1-6 and counting in just two years. Tanking is usually an effective strategy, but this particular tank job is happening on a team that didn’t need it. Gruden doesn’t seem concerned with alienating his current players, which is fine in the short run if you’re going to completely turn over the roster, but players around the league talk to each other. They know which franchises and which coaches are fun to play for and which are dysfunctional. They also prefer to go teams capable of winning quickly. Yes, the Raiders’ salary cap space means they’ll be able to sign some quality free agents simply by offering more money than anyone else. But for the moment, Gruden still has yet to demonstrate he has a handle on building a modern NFL team. All he’s shown is that he knows how to blow one up.